I was surfing this morning to locate Cheti-Chand celebrations in Dallas, and came across your News magazine on Google search. Just a word about me, I am a retired scientist visiting my children in US, but living in Ghatkopar, Mumbai. We are fortunate to be associates of Late Shri Hashu Advaniji, and at present also I am connected with the Chembur Colony, Yuvak Mandal, where we have a school for dumb and deaf children with more than 200 sudens, Hashu Advani College for Dumb and Deaf, for B. ED and many such activities, started by our departed friend and guide. I was in fact searching to find a place where Sindhi's are celebrating Cheti-Chand, in Dallas, and came cross your site and write up, hence this note. I think you are doing an excellent job of keeping Sindhyat alive, our senior friend Shri Jhamatmal Wadhwaniji, involved in Vivekanand Society and others are also doing an excellent job of keeping Sindhyat a live in India and abroad. Should you feel that you and your readers may be interested, in knowing a bit more about our activities in Chembur area, I shall be able to ask my colleagues to forward the same to you, for the benefit of your member’s knowledge. 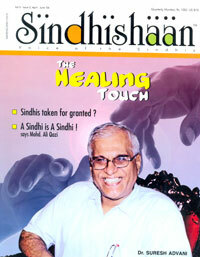 It is good to be able to write a Sindhi friend on Cheti-Chand and other topics, in USA.